When you’re an expat in Japan and you get a little tired of eating Japanese food, one type of American cuisine you won’t ever be hard-pressed to find is a hamburger. Between McDonald’s, Burger King, Mos Burger, Lotteria, and Freshness Burger, you’re bound to stumble upon a chain on some corner or another, and while you’re probably not going to find a quality meal at any one of these fast food shops, their burgers will likely satisfy your cravings. 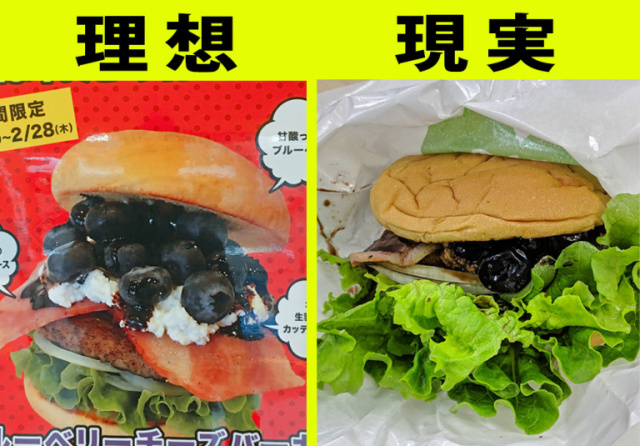 The exciting thing about fast food burger chains in Japan is that they’re always coming out with something new, so even if you’re not feeling a traditional cheeseburger with lettuce and tomato, you can try something unique to Japan’s burger industry, like the America-inspired Idaho Burger, or the Tempura Rice Bowl Burger. But today, dear readers, we tried something truly unusual in the history of burgerdom: a Blueberry Cheese Burger from Freshness Burger. We’ll admit, it wasn’t something we were dying to eat. But Burger King’s Blueberry Burger managed to impress us some years ago, so we decided to give this unusual burger, which is composed of a patty topped with bacon, cottage cheese, blueberries, and balsamic dressing, a chance. We picked one up at our local Freshness Burger and carried it home, wrapped carefully in Freshness Burger’s special burger paper. 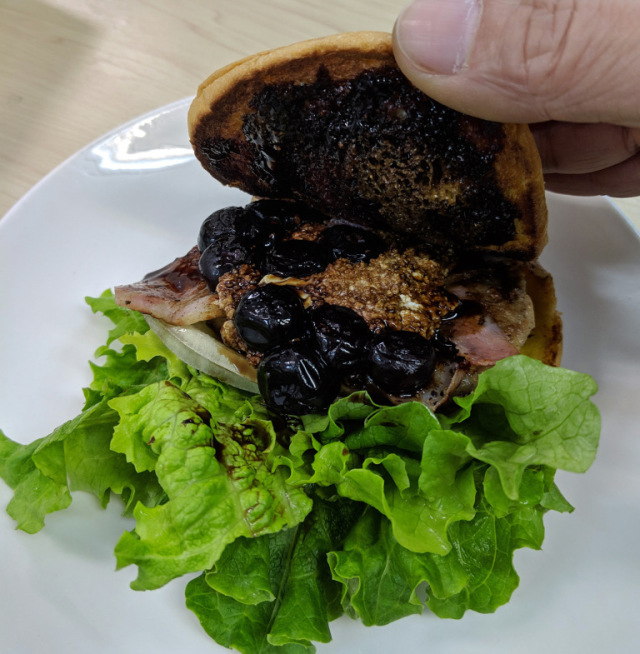 The dark color of the balsamic dressing had soaked into the bun, so it looked a little…morbid, and though the blueberries seemed to be of a decent quantity, at least compared to Burger King’s version, we were disappointed to see that there was a little less cheese than we had hoped. 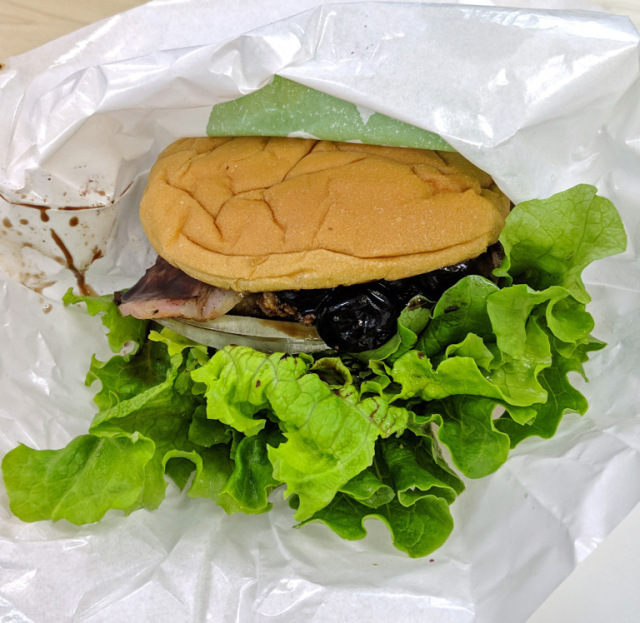 Despite the presence of sweet-and-sour blueberries and tart balsamic dressing, there was also very little scent to the burger, so all in all the appearance of this burger left something to be desired. Understandably, our expectations had been tempered a bit by the time we got to our first bite. The large blueberry it contained dominated the texture, but once the balsamic sauce kicked in, its sourness tied the whole thing together to actually give it a very balanced flavor. 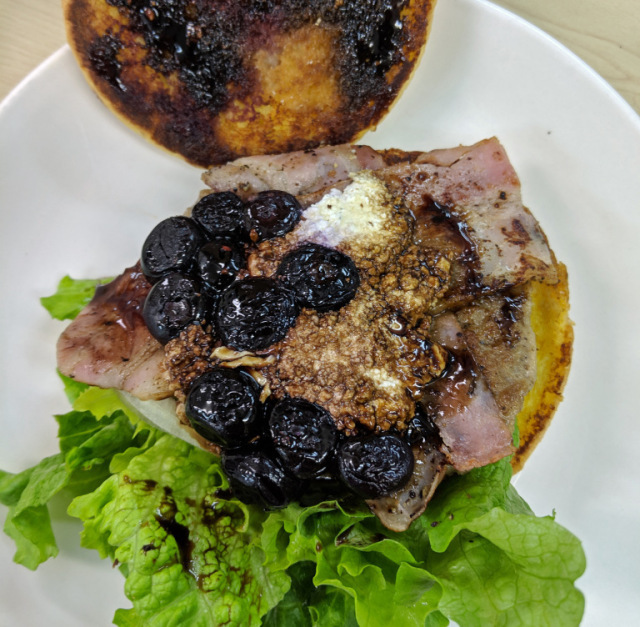 While initially we expected the blueberries to take the reins on our burger’s flavor, it was actually the balsamic sauce that kept each of the varying components under control and in a state of moderate deliciousness. Sadly, however, the presence of the patty is quite limited in this burger. Perhaps owing to its thin size, this burger lacks meatiness, which lends itself to feeling more like a sandwich than a hamburger. Nevertheless, it’s worth giving it a taste, if only for its uniqueness, and in any case, if your burger cravings aren’t truly satisfied after eating it, you can always pop over to McDonald’s and try one of their new teriyaki burgers, which are always a crowd favorite, instead. Sorry, as good as blueberries are, they don't belong on burgers. Put 'em in a blender with some vanilla ice cream and milk for a superb shake. Someone should be fired to proposing that abomination. We have to reinvent the wheel? But for the vegans this might be the best thing since sliced bread. Wonder if they’ll come out with a caramel burger one day. But for the vegans this might be the best thing since sliced bread. Something tells me the meat patty probably means it won't be. Or perhaps you don’t actually know what vegan means. The patty, bacon, and cottage cheese are all animal products. And if the bun contains eggs, it would be too. In another article posted here they are describing how more young people are becoming obese.